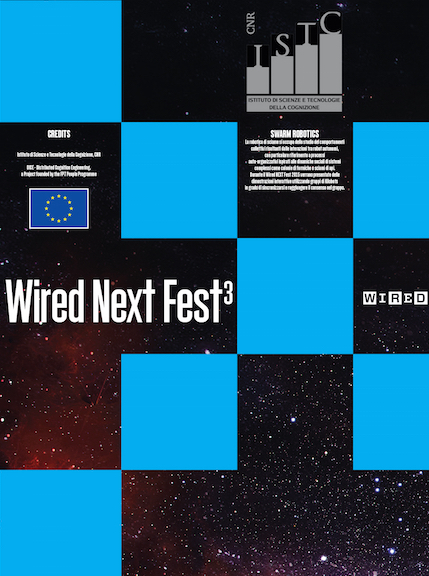 The Wired Next Fest is a festival dedicated to science and technological innovation, politics and culture, and is organised by the Italian branch of the world-famous Wired magazine. During this three-days event, Dr. Vito Trianni will present live demonstrations with both kilobots and people to demonstrate the power of collective behaviours emerging from simple rules. The event is carried out in the context of the DICE project, founded by the EU under the FP7 People programme, as a Marie Curee Carrer Integration Grant (Project ID: 631297). Additionally, a keynote talk will be given by Dr. Vito Trianni on Sunday, May the 24th, with the title "Robotics, super-organisms and collective intelligence". Here's the abstract of the presentation. "Seen from afar, a bird flock appears as a mutable and fascinating body. A super-organism composed of thousands of birds perfectly coordinated in their movements, and capable of complex collective responses resulting from the cooperation among birs. Starting from insights on the collective intelligence displayed by bird flocks, bee swarms and ant colonies, a new generation of robots is getting ready to leave the research labs and enter our everyday lives. This talk will discuss the state of the art and the perspectives of the swarm robotics research domain."